← Why Does Jesus Give Us Commands To Obey? So What Are These Commands of Christ We’re Supposed To Teach People to Obey? As a discipler, I would note that there are reasons why we get a book called the New Testament rather than a single sheet of paper entitled Commands of Christ–Summary List. Primary among those reasons is that Christ is at least as focused, if not more so, on the why and how of undertaking his commands as he is on the what. So, yes, context matters (supremely) with regard to the commands of Christ. That being said, I would also note as a discipler that there is tremendous pedagogical value in coaching those you’re discipling to create their own reference list of the commands of Christ, compiled as they read the gospels. What you mine from the Scriptures is yours forever; what someone else mines for you is theirs forever and never quite yours. Galen Currah’s 300+ Commands of Jesus. Most lists of the commands of Jesus include 38, or 50, or 125 depending upon which commands the author discerns apply directly to Christians today. For example, throw your net on the right side of the boat and you will find some fish is a command of Jesus; however, it is likely worth differentiating from as I have loved you, so you must love one another. But determining the generalizability of some of the commands of Jesus is not nearly as easy; what’s more, even in the commands of Jesus that don’t apply directly to us there’s a lot we can learn. So Currah’s list of 300+ commands is both useful and impressive. He lists each command and indicates whether he believes the command is general or specific, as well as whether it is grammatically indirect or direct. Make sure to check it out and print off a copy for study. Peter Wittstock’s book, Hear Him! The One Hundred Twenty-Five Commands of Jesus, lists each of Jesus’ commands in the gospels that Wittstock contends is addressed to all believers. Wittstock also provides a short explanation of each command (with insights culled from his own study of the Greek text), as well as a statement of the audience to which Jesus first spoke the command and a list of related Scripture verses for further study. Sure, there’s a few interesting additions to the 125 commands, like a prophecy related to the destruction of the World Trade Center, but it’s like having a conversation with that fun uncle of yours who taught you how to change the oil in your car while simultaneously seeking to convince you that Apollo 11 never landed on the moon: You can somehow distinguish between the two lessons, appreciating the one and nodding politely during the other. A bit of viewer discretion is advised, in other words, but this is still a unique and helpful resource. Tom Blackaby’s The Commands of Christ: What It Really Means To Follow Jesus. Tom is Henry Blackaby’s son, and this 2012 book does a nice job categorizing and contextualizing the commands in order to make sure that no one mistakes them for the Stairway to Heaven. It makes a solid introductory read, as well as a good giveaway book for those you’ll disciple who still get an uneasy feeling about the (in our age sadly novel) idea that doing what Jesus commands is an integral part of the Christian life. Don’t permit these to become substitutes for creating your own compilation of commands, which is an inestimably valuable exercise. But you’ll find these resources helpful. 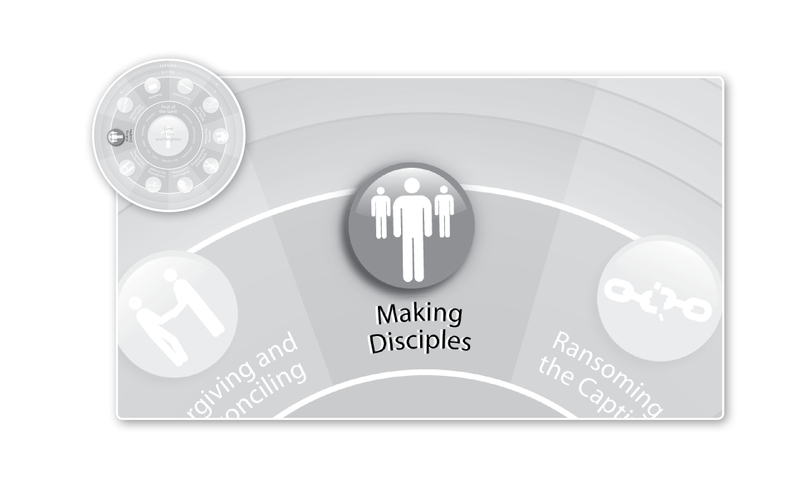 After all, considering and growing from the work of other disciples who have gone on before you is an essential aspect of the discipleship enterprise. This entry was posted in Making Disciples and tagged Commands of Christ, Great Commission, Making Disciples, Work of Mercy. Bookmark the permalink. 4 Responses to So What Are These Commands of Christ We’re Supposed To Teach People to Obey? Haha! that’s exactly the response i got from one young man who recently asked me to disciple him. when i said, “sure. my goal must simply be to teach you to obey all that Christ commanded us,” he got nervous and started asking “doesn’t that contradict good theology?” kind of questions. Hilarious! thanks for the insights, i’ve been pointing him regularly to this blog! Good work, James. Jesus sure never pulled punches when others approached him about discipleship. To the contrary he urged prospective disciples to count the cost–just like you did with this young man. Excellent. Throwing your net to the right side of the boat simply says to me do as I command and I will make your labor easy no matter how ridiculous it sounds. How many times are we prompted by the Spirit to do something and don’t because it just seems foolish. Maybe if we listen to those quiet commands of the heart we might just bring in a net full.